Dara Khosrowshahi, formerly CEO of Expedia, has brought to Uber some sweeping changes and a new focus on operating within the boundaries of good behavior. The ascendance of Uber Chief Executive Dara Khosrowshahi is often framed in the dullest possible terms. He is, according to the popular narrative, the grown-up grabbing the wheel of a speeding supercar from his testosterone-fueled predecessor — the brash billionaire, Travis Kalanick. Khosrowshahi, the story goes, is soft-spoken, disciplined and undeniably mature, a 48-year-old family man who is more inclined to follow rules than break them. That narrative fails to account for something that is increasingly clear about Khosrowshahi’s leadership style: Since joining the ride-hailing giant in August, observers say, he has been just as bold as he has been businesslike, imposing sweeping changes that would be considered dramatic in any corporate environment. Career: Spent 19 years as executive at Expedia and IAC/InterActiveCorp. Took Expedia from one website to Expedia Inc., with 17 brands and websites that include Hotels.com, Trivago, Orbitz, Travelocity and HomeAway. Named in August 2017 to be CEO of Uber. Those changes — big and small — include negotiating the end to a contentious battle with Waymo, strengthening background checks and embarking on a worldwide apology tour. Khosrowshahi has pushed his company to offer free rides in disaster zones and to marches for progressive causes. He has also filled his Twitter feed with images that reflect a warmer leadership style, opting for vulnerability over strength. Unlike Kalanick, a founder who was thrust into a leadership role almost overnight, Khosrowshahi was groomed over time. He spent more than a decade refining his executive skills at Expedia, where he was highly regarded as CEO. Seattle drafted a plan to tax Uber and Lyft traffic months ago. Now what? 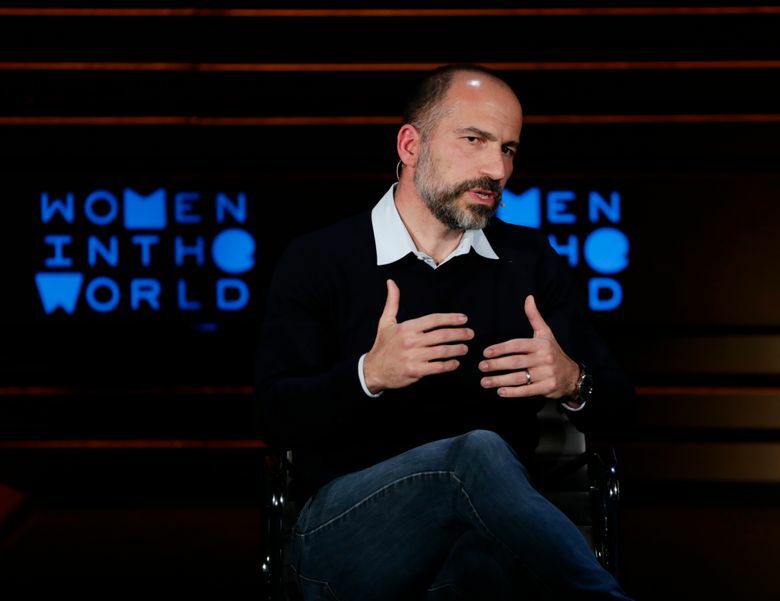 Khosrowshahi will have to show that his changes are permanent and reflect sincerely held values to win back customers who have deleted Uber’s app, said Jim Lucaszewski, a crisis consultant who quit using Uber as negative headlines mounted last year. The changes arrive at a crucial moment in Uber’s history. Despite being valued at almost $72 billion and growing last year, according to company officials, Uber remains unprofitable — with $4.5 billion in losses in 2017 alone. To turn a profit, Uber’s leadership must find a way to raise prices without losing riders or fares, a step that would also allow the company to increase driver pay, which remains a contentious issue worldwide. For almost all of its nine-year existence, Uber has been synonymous with a particular kind of unrestrained, Silicon Valley aggression. Channeling the energy of its confrontational founder, Travis Kalanick, the company evolved almost overnight from a whimsical idea into a multibillion-dollar slayer of traditional industry. Now it’s a force that operates in 65 countries around the world, employs more than 18,000 people and has more than 3 million active drivers. More than 75 million people use the service, according to Uber. Kalanick’s “always be hustlin’ ” rule-bending attitude was a force that forged the company. But his “us against the world” mentality — as one insider characterized it — nearly toppled Uber. With crises mounting, Kalanick resigned as CEO in June. Cleaning house, the company would eventually dismiss 20 employees for unacceptable behavior, including sexual-harassment issues, according to company officials. Willing to go to battle with mayors, mislead government investigators with fake apps and sacrifice relationships, Kalanick was a relentless unilateralist at heart. By most accounts, he appeared to believe fervently in his singular ability to reshape the business world and was willing to do so at any cost. The man now tasked with fixing Uber is in many ways his opposite. Multilateral and considerate, with a talent for building relationships and disarming enemies, Khosrowshahi appears at ease operating within the boundaries of good behavior. Eight months after he took over, Uber’s new CEO remains entrenched in a protracted makeover campaign, an effort taking place inside the company’s San Francisco headquarters and in far-flung cities around the world, according to Uber employees. His Twitter feed is awash with images of the easygoing CEO shaking hands with global leaders, snapping smiling selfies with drivers the world over, marching for justice and championing diversity alongside employees. In recent months, Khosrowshahi has attempted to repair damaged relationships in places like London and Brasilia and India, where the company had been accused of attempting to discredit the victim of a widely publicized sexual assault. Back at home, instead of prolonging a high-profile courtroom showdown with Waymo over allegations of stolen intellectual property, Khosrowshahi in February personally negotiated behind the scenes to reach a settlement. The compromise struck many as refreshingly low risk and drama free. In an effort to clean up the company’s toxic internal culture, Khosrowshahi has implemented other changes at Uber’s headquarters. He hired a chief diversity officer and reviewed his employee’s salaries to ensure that everyone — especially women and minorities — receives fair pay. Khosrowshahi has also made of a point of publicly emphasizing the importance of safety. This year, the company announced that it would mandate that drivers take six-hour breaks, a concession to rival taxi commissions, which have similar rules. Uber also announced plans to beef up its driver-screening process and plans to include an emergency button in the app that will connect riders to 911.